If you’ve been following my recipes for a while then you know I’m not dairy-free, gluten-free or anything-free-type-girl. I love using whole foods – cream, whole milk, butter, olive oil, real chocolate, real sugar, etc. However, when I set out to make this Roasted Cauliflower & Garlic Soup I wanted to make it as simple as possible and I wanted to try and make it without any cream, milk or cheese. I saw it as a personal challenge of sorts because I usually prefer soup with some cream. As I made this though, I sampled long the way 🙂 and found it delicious all on it’s own. I wanted a soup that would be nutritious, lighter and mainly vegetables. But I still wanted it to be filling and delicious. I believe this recipe fits the bill and is perfect for meals in the days following the holidays. We ate this after Thanksgiving when I didn’t really want much of anything. I think I’ll be making it after Christmas too. Check out the full recipe below. 2. Roast your garlic by using either a garlic roaster or head of garlic wrapped in tin foil (placed on top of a cookie sheet). Add 2 Tbsp. of olive oil to the roaster by pouring it over the garlic. Add salt and pepper as desired. I like to use freshly ground pepper and sea salt. 3. Cook for 45 minutes to 1 hour. 4. Spread cauliflower out on a cookie sheet and use 2 Tbsp. of olive oil to coat it. I use a basting brush to help ensure it covers the surface. 5. Sprinkle with salt and pepper and add it to the oven with the garlic. The cauliflower will cook in about 20-25 minutes. 6. Once the garlic is done, use a spoon to help coax the garlic out of each slot. I tried just using my fingers but it would always smoosh the garlic, which would be fine if it didn’t make a huge mess. If you wedge the spoon in between the pieces and use it to push the garlic up from the bottom it will work well. 7. Add your last two 2 Tbsp. of olive oil to a Dutch oven or pot on the stove and heat through. Then add your diced onion and cook till translucent. Stir frequently. 8. Combine the garlic, cauliflower and chicken broth in the blender and blend on your liquefy setting. Do this in stages if your blender isn’t large. 9. Add the blended soup to the Dutch over/pot and add your herbs. 10. Simmer for at least one hour. I simmered mine for about two but one is enough to combine all the flavors. If you’re going to add bacon as a topping like I did cook it while the soup simmers. Serve immediately and add any garnish like the bacon, green onion and fresh cracked pepper on mine. There might seem like there are a lot of steps but it’s really a simple recipe. Once you get things to blend you literally dump it all into a pot. I hope you try it and love it! 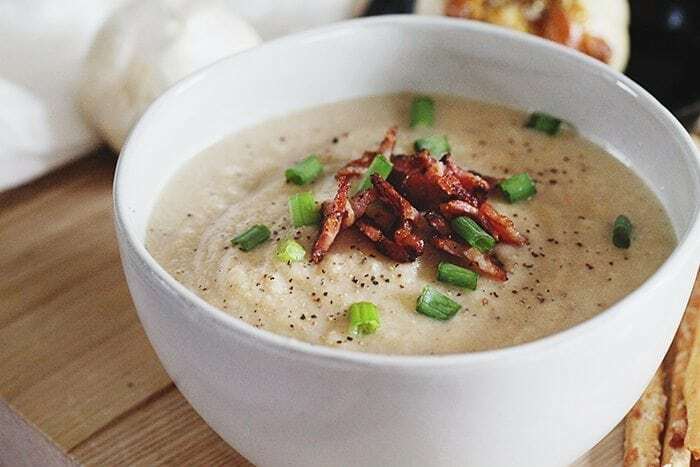 The roasting of the cauliflower and garlic really gives the whole soup a nice, robust flavor that’s perfect for winter. This looks fantastic! I, too, am gluten free and I’m trying like heck to be dairy free too, but that’s a little harder because I love cheese! 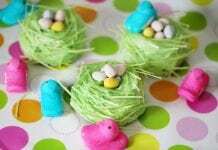 Thanks for sharing your recipe along with the step by step photos. I’m pinning this for winter time eats! I love garlic and cauliflower so I know I would like this soup. It has a lot of garlic and I have never cooked it this way so I am interested to see how it comes out. This sounds delicious! 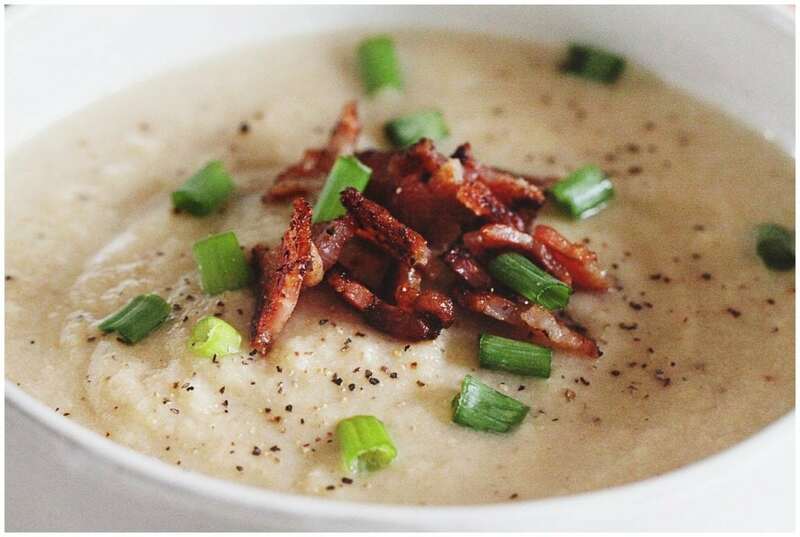 I love potato soup and I’ve heard cauliflower is a great substitute! I’ll have to try this! This reminds me so much of a creamy potato soup, which I love! This sounds like a wonderful low car alternative! This soup sounds seriously amazing. I love a warm bowl of soup on a cold winter day!! YUM! This looks so delicious. I know this is something my mom and grandma would love, they’re obsessed with cauliflower and garlic! Love cauliflower and everything that you can do with it! I think this one’s perfect for a cozy night in during the winter! Thanks for the recipe! Love that it’s dairy free!!! I have never tried anything with cauliflower that I do not like. 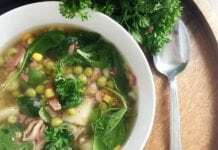 I’d love to try this healthy soup recipe! Oh my! 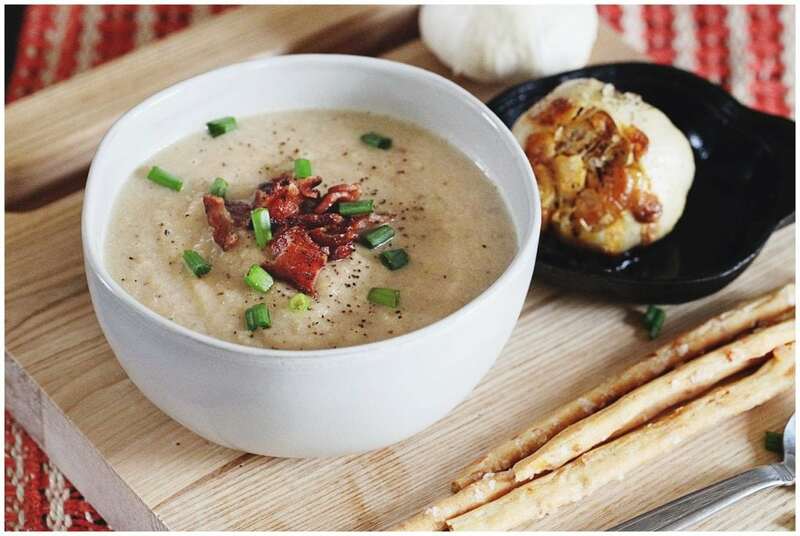 This Roasted Cauliflower & Garlic Soup is soooo yummy! I love any recipe with cauliflower because it help me combat my cravings for rice, potatoes, bread, and pasta. Thanks for sharing! Ok, the first thing I did was pin this because I definitely want to keep this recipe. I love cauliflower and garlic but haven’t really had them together. Certainly not in a soup! Yum! Wow this looks like a really great comfort food dish, I am going to have to try to make this soon. So easy and simple! The only thing I’ll have to buy is cauliflower lol. Love it! This soup sounds delicious! Simple and easy. I’m a big fan of cauliflower and can’t wait to try it. I love your recipes because you are not the anything-free kind of girl! 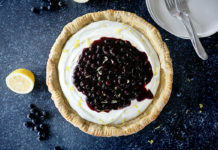 But it is also marvelous to see you try this gluten free recipe which I will try because it is coming from a genuine whole food person and that is why your recommendation on this matters. Will give this simple soup a try! This looks so good! I love cauliflower and it has finally started cooling off in Oklahoma. The roasted garlic just puts this over the top. Never tried anything like this. It looks delicious! I love roasting my vegetables before making them into soup, too! I think it adds a whole new layer of flavor to the soup. This sounds yummy! I love cauliflower soup. I made a version myself with coconut milk. I’ve often thought about roasting the cauliflower before cooking it with the onion. I’ll have to give this version a try as well. I love anything with garlic in it. I have such a hard time with cauliflower. But I think in a soup I would really enjoy it. This looks really tasty! Mmmm! This looks so amazing! I love roasted garlic and cauliflower. I’ve been soup obsessed lately, I’ll be making this soon. It looks so creamy so I could see how it satisfies without using actual cream or dairy. It finally turned cold here today so you are making me crave soup. This looks awesome! I am trying to find more vegetarian/ semi-vegetarian recipes to share with my readers, and I love this! This looks & sounds soo flavorful! As someone who has to be gluten & dairy free because of allergies, I very much appreciate people stepping outside of their comfort zones to try creating new things!! This looks so yummy. My daughters really like soup and garlic so this sounds like a win! It’s fantastic that we would be sneaking in some extra veggies too. YUM. I was so excited about this! Made it and put LESS than the recommended amount of garlic salt and tried eating it. It was WAAAAAY too salty, to the point of being inedible.